Continually prioritizing fast and easy solutions may help us hit release dates in the short term, but over time, repeatedly choosing shortcuts will leave us with mounting experience issues that adversely impact our users. These issues are known as UX debt and, if left unaddressed for too long, lead to costly, time-consuming problems that take effort to fix later on. Agile teams are particularly prone to UX debt as a result of heightened pressure to regularly ship new features and functionality. However, UX debt can accumulate in any project, regardless of the development methodology employed, and too much of it will result in a loss of trust, traffic, and revenue. In this article, we define UX debt and show how it can be identified; we also discuss methods for how to prioritize UX-debt issues and resolve them. While these methods are framed for Agile environments, they can easily be adapted to other development processes. Launching a suboptimal design impacts long-term market share, because many customers will give you one try and then give up when the design is too difficult or doesn’t satisfy their needs. Even if you fix their complaint later, the users won’t know, because they won’t resample your site or product once they’ve had a bad experience. Users will become accustomed to the bad design. Then, after you change the design, people will be forced to change their habits and hate you for that. Changing the design back and forth for any particular component of the overall UX will degrade the feelings of consistency and coherency. Your failures will live forever on the internet. Since learning is social, users will continue to be “informed” for years of your missteps by blogs, message boards, video channels, and other sources that discuss the old version. Not only will this outdated information be harmful rather than helpful to your users, it will also scare away new prospects who come across descriptions of the bad design and any awkward workarounds people had discovered and posted. Any UX debt will incur some of these costs. But the longer the UX debt remains unpaid, the more these costs will mount (think of “compound interest” as an analogy). 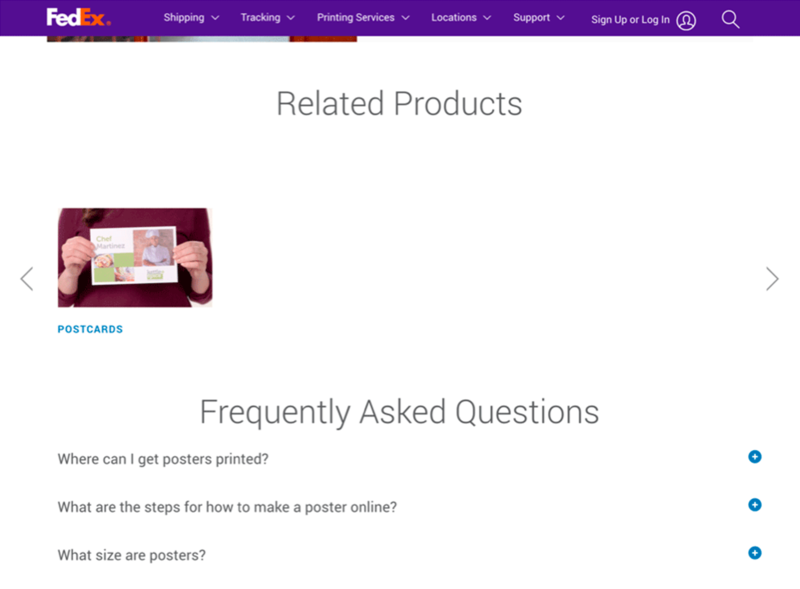 An example of UX debt can be seen on FedEx’s website in a carousel that appears on the product page for printed posters. Initially, the carousel displays four related products; however, clicking on the right arrow to view more related products reveals only one additional item. Rather than filling the content area with more images and links to related products, the carousel shows empty white space. A user looking for invitations or similar printed materials may grow frustrated at the lack of relevant products in this carousel. FedEx should add more related products to the carousel or update the functionality to accommodate varying amounts of content. As time goes by, teams easily forget about these seemingly small issues and the likelihood of going back to fix them diminishes when there’s pressure to move on to other priorities. However, these issues do impact users and should be addressed to preserve the website’s integrity. To resolve this example of UX debt, FedEx should add more related products or update the carousel functionality to accommodate varying amounts of content. Though the word debt is daunting for most people, the metaphor does not imply that UX debt should be avoided at all costs. Especially when working in Agile, there will be cases when speed to market and pressure to meet release dates necessitate time-saving alternatives. While certain types of UX debt (such as problems with integration, inconsistencies, and trouble preserving a simple conceptual model that explains and unites the entire user experience) are more likely in Agile, any decisions that will deliberately result in UX debt should be made carefully and collectively. Consider if getting to market faster is worth the risk of negatively affecting user perceptions and the high costs of fixing issues later on. When the answer is yes, the resulting UX debt should be tracked, managed, and, paid back gradually over time so that users don’t notice it and abandon the website or application entirely. 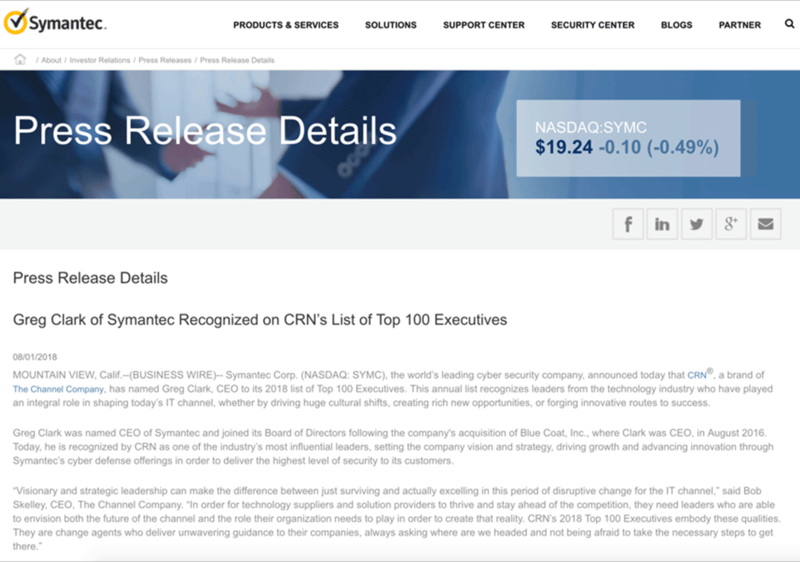 For example, a press release on Symantec’s investor-relations website contains body copy that is too low contrast to be considered accessible. Though low contrast is not a bug, it is an example of UX debt that could negatively impact low-vision or color-blind users. Per the WCAG guidelines, contrast ratios between text and background colors should be 4.5 to 1 for normal-size text. The contrast ratio between the text color and background color on this page is only 3.2 to 1 and therefore, too low to be considered accessible. Symantec should have selected a body-copy color that meets accessibility standards and must now remember to go back and fix this issue of UX debt. To resolve this example of UX debt, Symantec should select a darker body-copy color that results in a higher contrast ratio to meet accessibility standards. In addition to user feedback, set up recurring time with the entire product team, including developers, to review the overall health of the site or app. Open up the discussion for the rest of the team to bring forward any UX- or tech-debt items that may negatively impact the user experience. Product management can also bring up debt-related issues found by leadership or other stakeholders. If possible, share trends or patterns from analytics during the discussion so the team can decide together if further investigation is needed to identify debt. An example of an informational inconsistency in the UI that does count as UX debt was observed on Amazon. The shipping-for-returns page displayed inconsistent quantities for return items: the user wanted to return 4 pairs of pants, but the text on the page read Returning 2 items and the summary info said Refund subtotal for 3 items. This contradictory information caused the user to question the refund amount and to navigate back to the previous page to double check that the total estimated refund was correct. 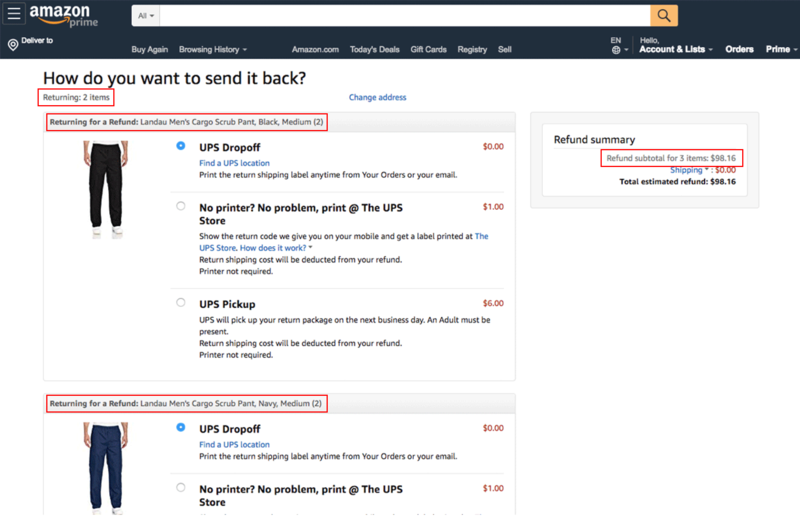 Amazon’s inconsistency is UX debt and should be addressed to help users move smoothly through the return process. A user on Amazon encountered contradictory, incorrect item quantities when executing a return. This inconsistency caused them to question Amazon’s credibility and accuracy. This type of issue counts as UX debt. When actual UX-debt issues and bugs like these are found, their severity, frequency, and location in the users’ journey should drive the issue valuation and prioritization. Though in the following sections we discuss how to track, prioritize, and resolve issues when working in the Agile development process, the approaches and concepts outlined can be adapted and applied to any development methodology and will help you track, rank, and gradually clean up UX debt over time. To make sure that UX debt gets the attention it deserves each sprint, create a product-backlog item or a label for UX debt and use the same severity indicators as for other items in the backlog. In this way, all items can be evaluated using the same dimensions for prioritization during grooming and planning. This method will also help teams look back and see how much UX debt was been paid back within a time period. What will improve the product experience the most: a new feature or making an existing feature usable? Quite often, the latter choice is best, since a feature that people can’t use might as well not exist. Thus, fixing something that doesn’t work for users has the same effect as adding a new feature, in terms of what customers actually get to use. Therefore, UX problems with existing features could and should often get assigned higher priority than new features. Moreover, features are usually implemented in order of expected benefit, so that an old feature is likely to be intrinsically more valuable than a new feature, if only the old feature could be made to work for users. Score each issue by assigning a value to the experience area, frequency, reporter, and level of effort to fix the issue. Then, use a prioritization matrix in the form of a scatter plot to see where the issues fall on the dimensions of user value and effort to fix. This visualization can help you rank issues and communicate progress in cleaning up UX debt back to stakeholders and leadership over time. 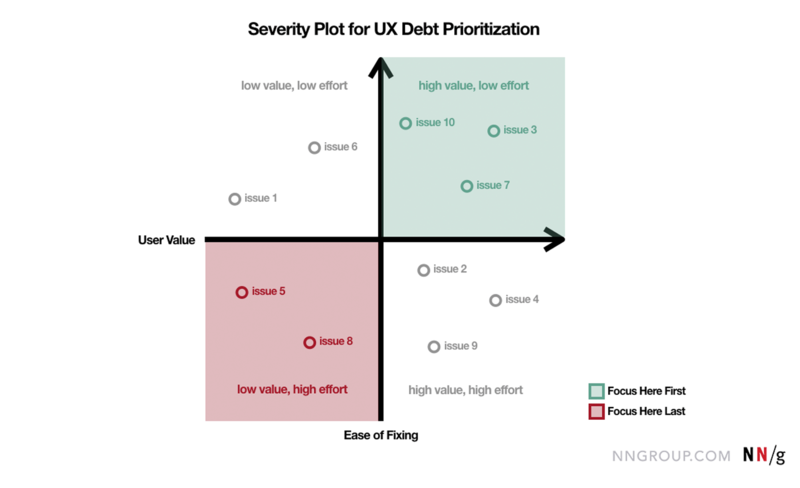 Visualizing UX debt in a scatter plot can help the team organize, understand, and prioritize issues based on user value and level of effort needed to fix the issue before adding them to the backlog. The most important consideration to keep in mind is that UX debt and technical debt should never be disregarded altogether. Many Agile organizations tend to prioritize tech debt over UX debt, but focusing on one type of debt over another will only lead to more problems for users and more expensive fixes in the end. It’s also important to realize that the two types of debt often go hand in hand. 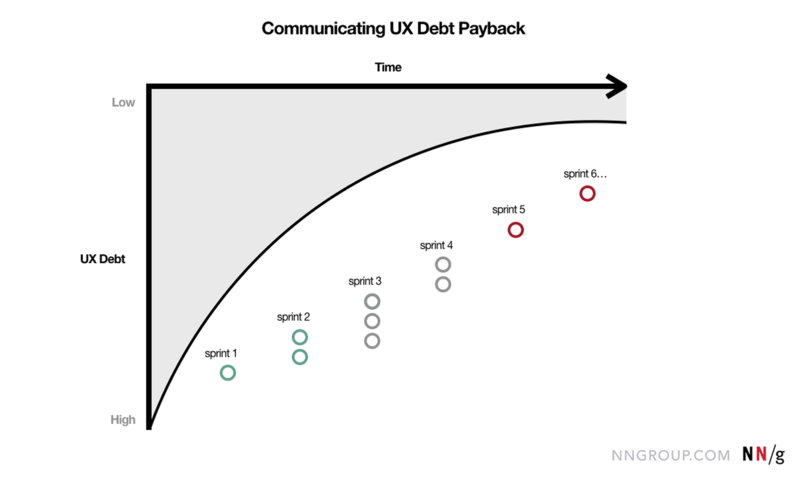 Don’t completely abandon UX debt in favor of addressing tech debt, or vice versa. Prioritize efforts that aim to reduce tech and UX debt at the same time. It’s more efficient and ensures you won’t dig yourself further into debt by focusing on one type while abandoning the other. This approach will also help the product maintain full trust and credibility with users. While the high-priority UX problems should definitely be fixed first, the lower-priority ones should not be abandoned completely. As the years go by, cumulated layers of barnacles will slow even the mightiest ship, and the user experience will feel like a lower and lower quality product, as users encounter small annoyances every step of their way. Paying down UX debt can feel daunting at first and will take time, but there are a few ways to resolve it while still making overall improvements to your digital products. One approach is to dedicate a specific number of story points to fix UX debt during each sprint or every other sprint. The number of story points can fluctuate over time depending on the team’s workload, but try to address at least one or two UX-debt items per sprint, preferably more if bandwidth allows. Use easy-to-understand visualizations, evidence from user testing, and clear explanations of what was accomplished in each sprint to help leadership and executives understand the progress made and why it’s important. Showing progress and communicating the value of resolving UX debt over time will help leadership and executives understand the importance and positive impact that cleanup has on the user experience. UX debt isn’t always avoidable but teams can organize and collaborate around how to address it. Include all of the right people as early as possible to discuss the risks of a premature or haphazard launch and develop a cadence in looking for less-than-optimal experience elements. Conduct regular user testing and heuristic reviews of the experience to ensure new UX-debt issues are found and prioritized. Leverage data, such as the scores used in severity plotting, to make the case for why certain issues warrant resolution over others, and show progress in debt-cleanup efforts. Acknowledging and formulating a plan for paying UX debt back over time will help you resolve it, before your users start to notice. For more information on how to identify, prioritize, and resolve UX debt, take our full-day training course, Lean UX and Agile.